Jill’s put to the test! 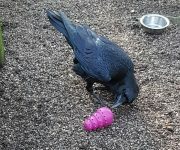 DZG’s raven, Jill, was put to the test when she received her daily treats in a kong. Bird keepers stuffed the plastic pink toy with chunks of beef, which they left in the enclosure for the playful nine-year-old bird to discover. Trainee Keeper, Jess Jones, said: “Jill loved the kong. “She has a very inquisitive … Continue reading Jill’s put to the test!